Many of the activities in the Donner Summit area utilize the abundance of trails in the area. Many of the trails are old logging roads and many are ski trails at the many ski resorts in the area. Most of the trails are on public property, but some do cross private property. Some of the trails are well maintained and some are more primitive. The Pacific Crest Trail runs north to south through the area. The trails can all be used for hiking and exploring the area on foot and some serve as excellent mountain biking trails. During the winter many of the trails are inaccessible and many are located on the many ski resorts in the area. The trails in the Royal Gorge ski area offer superb cross country skiing, but must be accessed with a trail pass from Royal Gorge. During the summer months the trails offer great hiking and mountain biking. In 2013 a large area of the Summit was acquired by the Truckee Donner Land Trust and designated as open space. As part of their stewardship of the land, the Land Trust is managing the 3,000 acres of open space through a planned multi-use trail system designed to offer open access to the area. 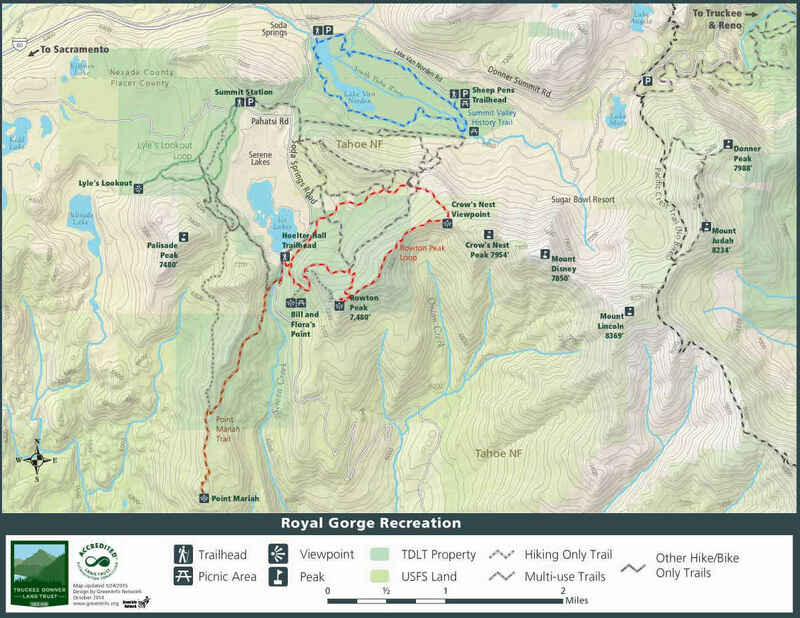 Formal trailheads and trails have been established and you should consult the map below to take advantage of the great outdoor opportunities offered by these trails. The trail guides listed here are not meant to be totally comprehensive but are for some of the best hiking and mountain biking in the area. They are meant only as guides and many variations are possible. The trail maps and information are generated from Google Maps and Google Earth, two wonderful tools for exploring the area online and highly recommended. Below are custom Google Maps that list many of the points of interest and trails in the area. The trail descriptions are generated from a combination of published information and practical experience. Aug 26 “get to know your forest hike” meeting at soda springs rd & beacon. 0930 see you there!